A Houston Chronicle investigation has found that Houston’s highways – and the drivers who use them – are the deadliest in the nation. The death toll from car crashes in the Houston area every year is “the equivalent of three fully loaded 737s,” the Chronicle reports. Steve Riley, deputy managing editor of investigations at the Houston Chronicle, says the story first came about through the paper’s transportation writer, Doug Begley. Riley says Begley had noticed a spike in traffic-accident deaths a few years ago, and decided to investigate. 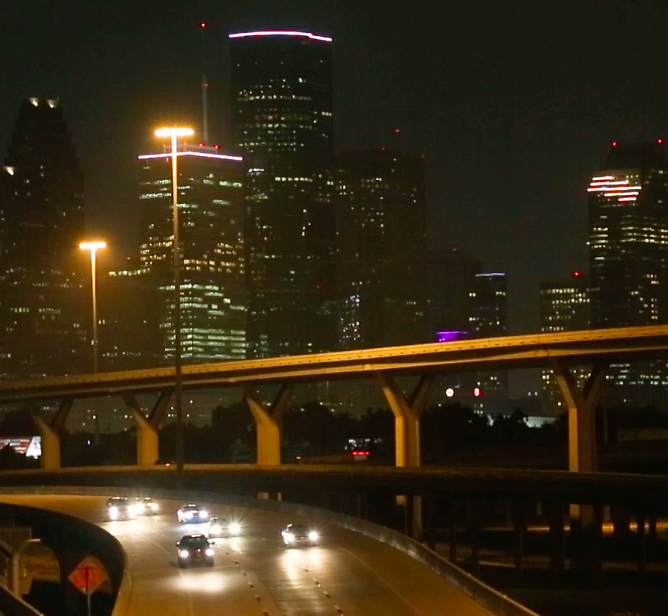 What he found was elevated rates of traffic deaths in the entire Houston-metropolitan area. Want to see drivers slow down? We've found some options for how to report the problem. But first, a quick primer on how setting speeds works. Speeds are determined by various local officials, depending on whose road it is. The starting point is Texas law sets the prima facie speed — the base minimum speed — at 30 mph in urban areas. County roads outside an urban area are based on 60 mph and any state highway designated by a number — ranging from farm-to-market roads to interstates — starts at 70 mph as a base speed. Texas Gov. Greg Abbott said it’s time to turn off red light cameras across Texas. Many believe the cameras violate the U.S. Constitution and lead to more rear-end accidents at intersections with cameras. Others say they make streets safer and generate needed revenue for cities across the state. But Monday, in McAllen, Abbott issued a 21-page report — Safeguarding, Securing, Serving — calling for policies he would support if he’s re-elected to a second term in November. A peaceful protest in downtown Dallas over the police shootings of Alton Sterling and Philando Castile turned violent in July 2016, when a gunman took the lives of five police officers. At the time, Dallas Sen. Royce West called Dallas “ground zero for change” and said he wanted to address the tension between law enforcement and the minority community. The result is a law the Legislature passed last year to require that Texas students, drivers and law enforcement be taught how to behave during traffic stops. Connie Moss recently read a news story about a man who was stopped by police in Texas, and during that stop he was asked to present his vehicle’s registration. "I was wondering why this person went to get his registration out of the car," she said. "I've got my registration sticker, insurance, driver's license, but I don't carry the registration." She said she was aware that police often ask drivers during traffic stops to present their driver’s license and insurance, but her vehicle’s registration was something she had never carried with her. She said she began to wonder if she had been driving in Texas for 30 years without proper documentation. More and more, drivers are recognizing the value in having vehicles with advanced driver assistance systems (ADAS) like blind spot monitoring systems, forward collision warning and lane keeping assist. However, while many of these technologies are rapidly being offered as standard, many drivers are unaware of the safety limitations of ADAS in their vehicles, according to new research from the AAA Foundation for Traffic Safety. For example, researchers found that nearly 80 percent of drivers with blind spot monitoring systems were unaware of limitations or incorrectly believed the system could accurately detect vehicles passing at very high speeds or bicycles and pedestrians. In reality, the technology can only detect when a vehicle is traveling in a driver’s blind spot and many systems do not reliably detect pedestrians or cyclists. Lack of understanding or confusion about the proper function of ADAS technologies can lead to misuse and overreliance on the systems, which could result in a deadly crash. The weather may be cooling down, but there is no drop in the death count on Houston roads, continuing their reputation as the nation’s deadliest. Drowsy Texas drivers are more likely to kill someone than in any other state. The National Highway Traffic Safety Administration put together the new data. Attorney General Ken Paxton and representatives from all other states and Washington, D.C announced a $148 million settlement with Uber over its one-year delay in reporting a data breach regarding its drivers. Welcome to the Dallas area! You’ll encounter some quaint local customs. But we’ll save for another day discussions of bootwear, sauceless barbecue, the heresy of beans in chili, watering your foundation, pronouncing Gruene and Mexia, and deep-fried heaven-knows-what at the State Fair of Texas. We’ve all seen it: The light turns green but the guy ahead of us doesn’t move — until he lifts his head from looking at his cellphone. Or the car ahead of you on the four-lane highway wanders in and out of its lane. You seize the opportunity to zip past and see the driver on her cellphone. Like the rest of America, we Texans love our cars and our cellphones. Unfortunately, the combination threatens to kill us. Texas enacted a ban on texting and driving on Sept. 1, 2017, to try and reduce the risk. But we believe the law is ineffectual and nearly unenforceable. Mishann Childers slowed as the flashing lights came into view. Telge Road in northwest Harris County was closed. A crash, a sheriff's deputy said. Someone hit a silver Buick. Her husband, Wayne, drove a silver Buick. He often took that road. Owen McNett's blood-alcohol content was nearly four times the legal limit when he crashed into Wayne Childers' car, killing him, police said. Five times before, McNett had been arrested for driving drunk, with two lengthy prison stays. That rainy Friday night in February became the sixth. He had a valid Texas driver's license. Along Highway 48 in Cameron County, brown pelicans spend time around flying low and often, get stuck in the lanes of traffic. A Texas Department of Transportation engineer believes the bridge is causing a turbulence that affects the bird.